Comixplanations – DC Vs Marvel Comics (90’cember) | Superhero etc. First a little background on the comic. 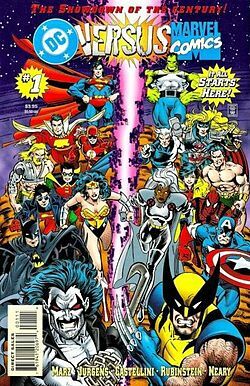 DC Vs Marvel (#2 and #3 being called Marvel Comics Vs DC for some reason) was a 4-issue miniseries written by Ron Marz and Peter David and drawn by Dan Jurgens and Claudio Castellini. The story focuses on two entities that embodies both universes respectively discovering that each other exists and decides that only one may survive. This causes them to select different characters from their own universes to fight each other and the universe with the most wins get’s to survive while the losing universe is destroyed. Although this takes place outside the main continuities so it truly wouldn’t effect anything. There was eleven battles in total but the results of five of the battles where voted on by the fans. The six battles that the writers chose the result of includes the following: Aquaman (DC) Vs Namor (Marvel), Catwoman (DC) Vs Elektra (Marvel), Flash (DC) Vs Quicksilver (Marvel), Robin (DC) Vs Jubilee (Marvel), Green Lantern (DC) Vs Silver Surfer (Marvel), and Captain Marvel (DC) Vs Thor (Marvel). The five fan-voted battles includes: Superman (DC) Vs The Hulk (Marvel), Superboy (DC) Vs Spider-man (Marvel), Batman (DC) Vs Captain America (Marvel), Lobo (DC) Vs Wolverine (Marvel), and Wonder Woman (DC) Vs Storm (Marvel). So in case you didn’t notice, the writer decided battles ended in a tie (3 to 3) specifically so the fans would vote for Marvel or DC to win. Marvel won by one battle (3 to 2) so the Marvel universe was destroyed…right? Well actually no, in a last ditch effort to survive the two entities fused into one and combined their universes into one universe with fused characters. 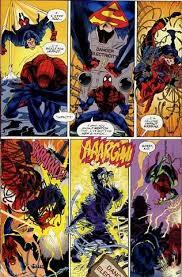 This universe was went under the name Amalgam Comics and we’ll talk about that more in-depth next week. Yup, a cliffhanger! See ya next week! So I originally planned to end 90’cember by going over the Death of Superman since that story line is probably one of the most iconic story lines of that specific decade and I needed a DC oriented post since I’m also planning on going over Marvel 2099. However, since Doomsday plays a major part in that story and he’s been confirmed to be showing up in Batman V Superman, do you guys just want me to go over him instead? Either way I’m going to end up talking about him but depending on which is voted higher I’ll either talk more in-depth about Doomsday (including his origin, Death of Superman, his comic book appearances after Death of Superman, and his appearances outside of comics which will probably include more of my opinions on him appearing in Batman V Superman) or just the story line Death of Superman (including why the story was made, what happened during then story, what resulted from the event, and real world effects of the comic). This is the big DC vs Marvel crossover that I have still not read so that’s a shame. I really want to read this someday, but my library doesn’t let it get checked out yet since it’s a reference copy. 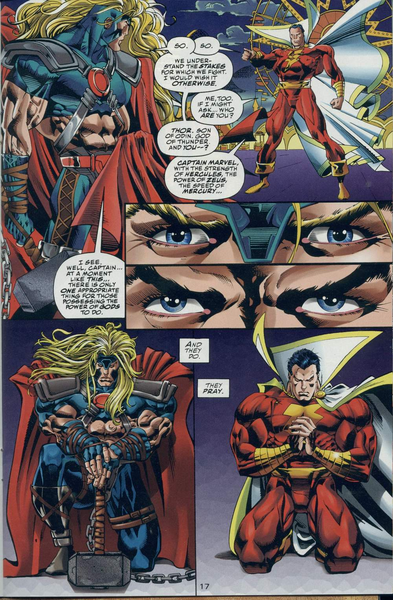 From the fights I definitely disagreed with Thor beating Shazam. It’s a little iffy, but I still consider Shazam to be slightly stronger. I do like the way that Thor stole his thunder, but I agree that it shouldn’t have caused him to randomly be defeated. A quick surrender there would have worked. I’d definitely pick Aquaman to stomp Namor in the New 52, but Pre 52…it’s a little murky. 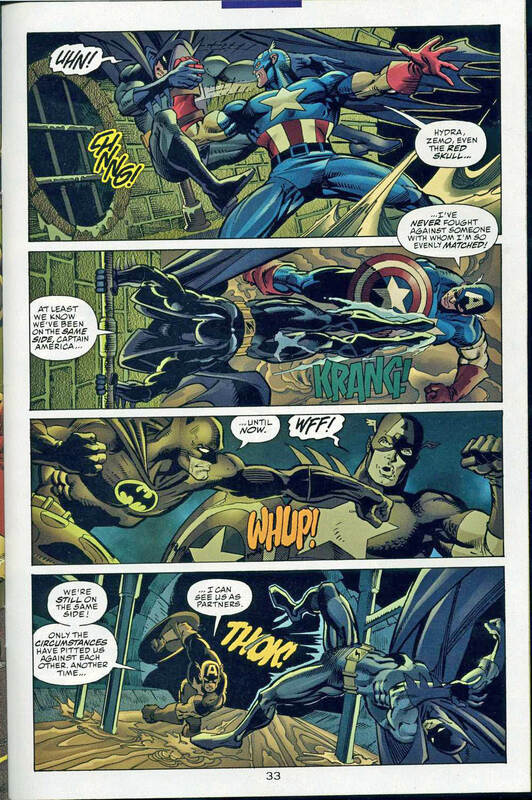 Namor’s been shown to fight on par with heavy hitters like the Hulk. 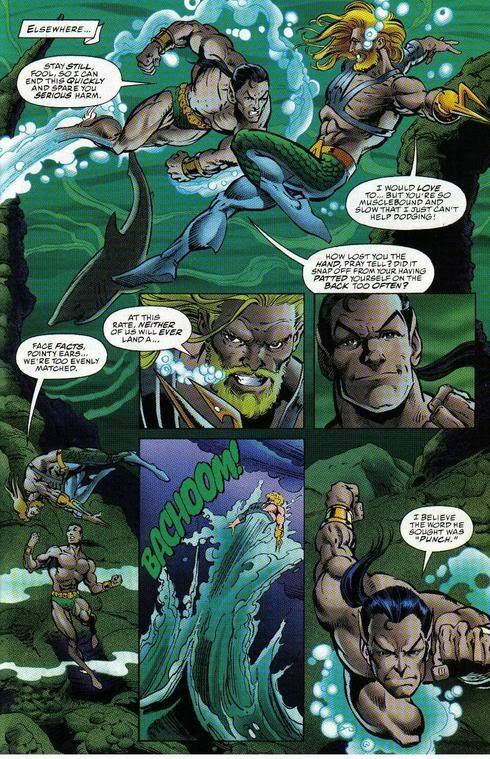 I don’t think Aquaman was quite that strong and the Whale is heavy, but Namor could have just dodged in theory. I guess he couldn’t react in time? Yeah, Silver Surfer’s definitely faster than Quicksilver. 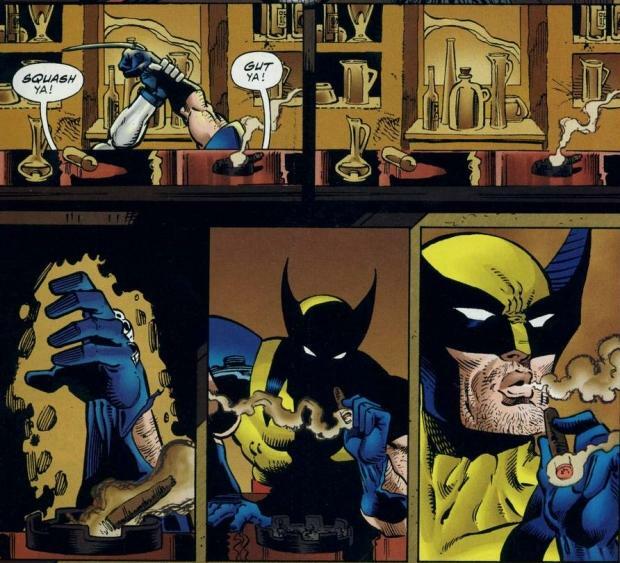 Quickie’s not even in the top 10 Marvel characters in speed anymore, but that’s because the comics got so extreme. Flash still is and will always be the fastest comic character. (coughasidefromsupermancough) Did you see the comic where Flash entered the Marvel Universe and beat all of their characters in a race? It was an awesome issue that I have not read, but read about. It was a homage to Barry’s death over in DC. 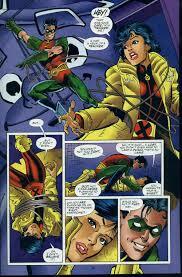 I think Robin should definitely beat Jubilee although I didn’t care for the romance. From his perspective though, she’s just a human with a spark gun so he’s dealt with many criminals like that before. It should be easy enough to stop her attacks. Green Lantern should destroy SS imo. No matter which Lantern it is…well, okay, only the big 3 could beat SS. Stewary, Jordan, and Reyner. I’m fine with SS beating anyone else, although the fight sounds like it played out rather oddly. Elecktra was trained by the Hand so I’d consider her to be more talented, but just falling and hitting a building? Definitely anticlimactic and I agree that Catwoman’s athletics are better than that. The fan voted battles are where everything went to chaos and inaccuracy. Lobo would destroy Wolverine with a punch and Wonder Woman would laugh off the lightning bolts. Superboy would probably overwhelm Spidey, but I’m honestly not too upset with that one since I think Spider Sense is borderline overpowered. Superman and Batman won their battles as they should though so that was good. In the end I agreed with 5 and disagreed with 6. Not too shabby actually. Hehe, tbh I kinda expected you to have a few thoughts on these battles considering your blog. I really don’t know much about Namor and that might have something to do with his connection to the Fantastic Four and my lack of interest in that particular team but honestly I just don’t know. I like that Aquaman won due to my own personal bias and the fact that Aquaman was a lot more bas@$$ than most people give him credit for (and this was before they amped him up in the New 52). 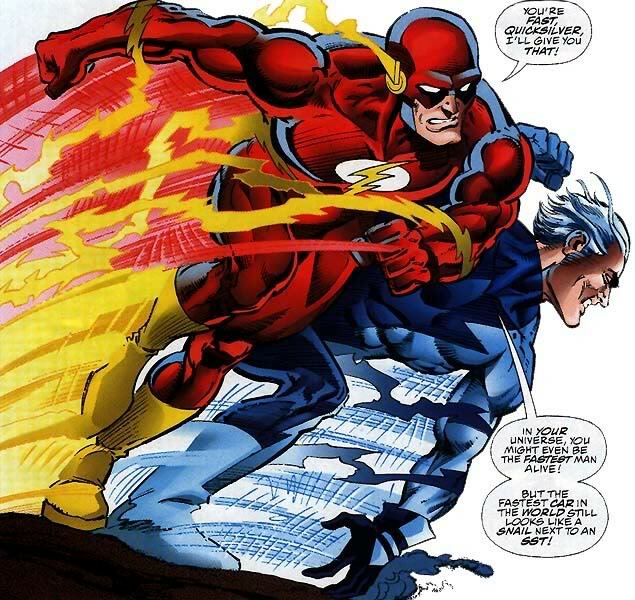 I agree with you on Flash and Quicksilver and I think most fans would agree. I actually never heard of that particular comic but I don’t not believe it happened. Robin beats Jubilee hands down, no debate. The romance didn’t play that large of a role in the story and could’ve easily cut it out but I do admit it was kinda cute imo. I’d agree with Hal Jordan and maybe John Stewart but at this point in time not Kyle Reyner. 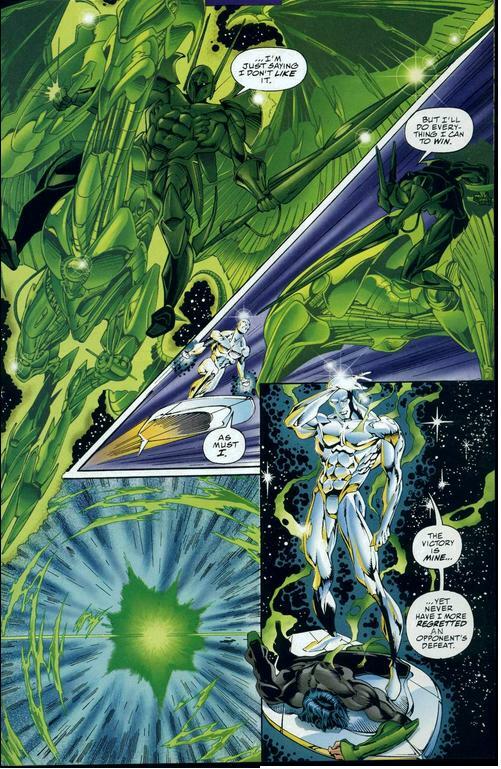 Maybe later after Kyle becomes a white lantern and all that jazz but at this point in time I don’t really see Kyle puting up much of a fight against Silver Surfer. I have no problem with Elektra winning, I just don’t like how it was done. They could’ve though of anything from stabing Catwoman with her weapons or something of that nature but instead they just tossed Catwoman off a building. It was just lame stupid. Lol, fan voted battles are obviously going to be based off of popularity of the characters rather than who is logically capable of defeating the other. Lobo and Wonder Woman definitely should’ve one their battles but I guess the 90’s X-Men cartoon allowed them to win in the end. 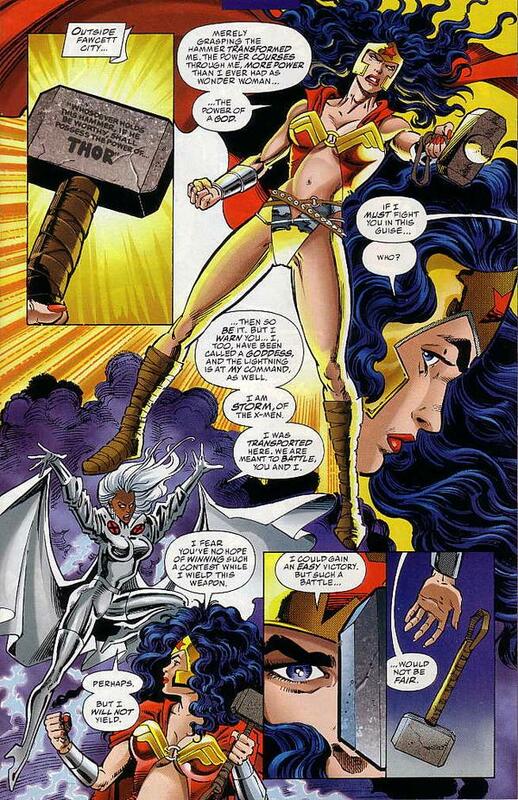 Wonder Woman ticks me off the most considering that all Storm did was throw a few lightning bolts at her. Somewhat insulting honestly. I’m curious, other than Quicksilver Vs Flash have you done any of these battles on your blog? If not than maybe here’s some inapiration for ya! 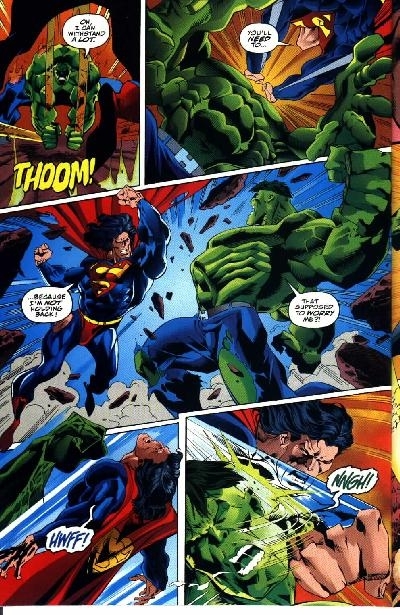 For my vote for Doomsday or Death of Superman, I would like to say both, but overall Death of Superman. I agree with what you said about the fights that they were badly matched and the endings to them were poor. Yet, normally when the companies work together in no way does the story do any character justice. Thanks for your review and looking forward to the rest of 90cember. Honestly regardless of whether I talk about Doomsday or Death of Superman I’ll have to talk about both since you can’t really talk about one without the other. Trying to do that would be like trying to talk about Bane without mentioning Knightfall or talking about Knightfall without mentioning Bane, it’s just impractical. But depending on how he voting goes (so far it seems like I’ll be doing Death of Superman) I’ll wither end up talking mainly on the comic or the character more. I think the main reasons the battles are poorly done is that neither companies wants their characters to look bad so they come up with weak ways to end battles instead.